While U.S. Olympic Gold Medalist Gabby Douglas should be celebrating and celebrated for her win as the best female gymnast at this year’s London Olympic Games, she must instead endure racism from America’s most racist segment: her fellow Black women (and some Black men, too). Douglas is beautiful, poised, and in interviews I’ve seen her give, she is well-spoken and classy well beyond her young 16 years (because she’s worked hard and sacrificed the way others her age in America haven’t). And, yet, she’s come under attack from Black women for her hair. If a White person dared say some of the horribly mean things Black women said about Douglas on Twitter (follow me on Twitter), they’d be called out for racism. At least one Black Twitterer called Douglas, “a beast,” because of her hair. (Some of the tweets are below.) But, as we all know, there is a great deal of self-hatred and racism within the Black community that is stronger than anything the Klan could ever posit. Remember when these same women were among a mob of Black Americans and White uber-liberals (and faux-conservative/professional victim, Michelle “I Am a Woman of Color” Malkin) demanding Don Imus’ ouster from CBS Radio for referring to the alleged “nappy headed” nature of a Black female college basketball player? True, he also threw in the word, “ho,” but do you think the result would have been any different, had he just stuck with the hair criticism? Why are these self-hating Black women on Twitter getting away with this? Because minorities can be racist and self-hating and get away with it, unlike the rest of America. There’s a double standard on everything. It’s gotten so bad that even Black websites, like Essence, The Root, and The Grio, have had to admonish fellow Blacks and tell them to shut the heck up about Douglas’ hair. One tweet I saw from Douglas’ fellow Black Americans on Twitter referred to her as “ratch,” a racist term used by Blacks to describe fellow female Blacks who are “too ghetto” and resemble drunken fat whores. A madam of the nasty ghetto species, dressed in an ensemble of cheetah print leggings and a leotard, not to mention the thong 4 sizes too small beneath these items. On top of her head is generally perched a purple weave, often resembling shredded plastic. A lady of this sort may be caught sipping a beverage called Baby Drank, or 4loko mixed with rufie [DS: sic]. And the definition goes on and gets worse. Frankly, I’m not quite sure what the problem with Douglas’ hair is. It looks fine to me, but maybe it’s another one of those fictional “it’s a Black thing–you wouldn’t understand” moments. When she performed and, later, when she accepted her medals on the stand, her hair was pulled back and up with polish and dignity, just as it was with her fellow White and Asian gymnasts on the U.S. Women’s Olympic Gymnastics Team. Is there something wrong with a Black woman with her hair pulled back while she’s on the balance beams and the floor mat? Maybe I missed something. What I won’t miss are all the endorsement and advertising deals she’ll soon get because of her achievements, and she’ll be laughing all the way to the bank, whatever her hair style is. It’s pretty obvious that there’s an element of jealousy by all of these Black women attacking Douglas. Gymnastics is considered a “White” sport in America. Douglas is the first Black American woman to win the prized Olympic Gold Medal as the best overall female gymnast, and she’s one of only two Black women ever to make the U.S. Olympic Gymnastics Team. Her mother sent her away to predominantly White Iowa to train for years on end. And I think the Black women criticizing her resent this. They won’t openly admit it, but they think this makes her too White–her hard work, her polish, and other characteristics that are sadly viewed as “unhip” in Black American culture today. Ditto for the fact that she speaks English without a Black or Ebonics accent. We’ve seen this before. All of this clearly bothers a certain portion of Black America. It has to. Because her hair isn’t the problem here and shouldn’t be. It’s not like she’s walking around with an Afro, and so what if she were? Black women have a certain texture of hair and there’s no reason they cannot display it the way they want, including pulled back with bobby pins and clips in a pony tail or a loose bun, as with Douglas’ coiffure. You don’t see White people attacking Douglas’ hair. Just Blacks. And maybe there’s also an element of refusal to give up the mantle of victimhood, instead of embracing the “we are the champions” mentality and pride that is appropriate here. Giving up the perks of victimhood is expensive. Leaving the plantation is tough. Does Douglas’ success and embrace by White America make her “not Black enough”? Frankly, Black women should be applauding Douglas for not spending a zillion years as many Black women do, using scar-inducing hot combs and chemical relaxer to constantly smooth her hair. If you’ve seen “Good Hair,” the Chris Rock documentary on this (read my review), or lived amidst Black America (as I do), you know what I mean. It’s a form of slavery to their hair they voluntarily put upon themselves to look more like the White women that they hate. 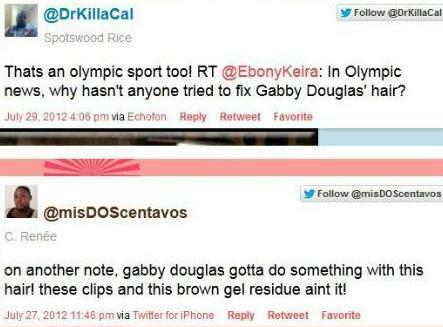 And now they attack Gabby Douglas because, instead of having paid thousands of dollars and spent many hours of time on expensive hair extensions, weaves, and straightening techniques, she spent that money on gymnastics coaches and that time in the gym and on the balance beam. Many estimates say that up to a third of Twitter users are Black. And that’s probably true, since Black topics and hashtags frequently ascend Twitter’s trending topics. How sad that a good portion of that third is filled with Black racism against a talented Black American woman of whom we should all be proud, regardless of race. 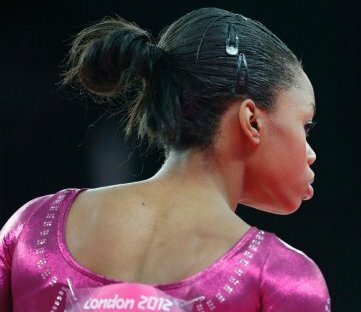 The next time Black America throws around the racism word, remind them what they said about Gabby Douglas’ coif, while we were proud of her. So let’s take a few tweets by some Twitters and make a big national issue about it because it’s a slow news day. Fact is, all the African-Americans I know support Gabby. Condelezza Rice even call her an African-American hero. She makes us all proud and I’m happy for her. This is much ado about nothing, espeically considering a White man just shot up a Sihk house of worship today and killed 6 people. Sorry to disappoint you Ashley but not all of the blacks are supportive of Gabby. Maybe all of the ones you know are but not all. The stupid tweets that Debbie has pointed out bear that fact. I know a few of my co workers and friends that are black and they have made stupid comments not just about her hair but how she talks(talks too white), her lips(dsl’s) and other dumb comments. She has been derided by members of her own race instead of being made into the positive role model that she is. These are the same morons who don’t have a problem with Serena Williams’ goofy behavior at the Olympics. Reading those tweets made me sick. The issue of “Hair” in the Black community has kept many from exceling in sports such as swimming as well as gymnastics. Not to mention how much the “Hair” issue has played a big part in terms of Healthy living. There are a great number of Black woman who spend thousands of dollars on their hair but won’t spend a penny on a Gym membership or buying healthier foods. On one of the threads about Gabby’s hair, a teacher noted how he has had Black female students stay at home on rainy days because they did not want to mess up there hairdo’s. Gayle, Yes, but it was white racists that created this dilemma in the first place. As Gerald explained in his post above white people did not accept black women wearing their hair naturally and it was expected they straighten it in order to be accepted in white society, and especially if they want to get a job. JEALOUSY! Evil strand in the democratic mindset! I bet all these people insulting Gabby are voted for Obama. It’s all part of the left’s mentality of hating successful individuals! Anyone who works hard and breaks away from the welfare lifestyle is verbally attacked with one insult after another! But hey, keep voting Democrat, it has worked out so well for you! How is noting that her hair is unkempt raciest? What’s raciest is your statement “she must instead endure racism from America’s most racist segment: her fellow Black women (and some Black men, too).” Painting black women as the “most racist” is truly disgusting. The fact is her hair was messy and that’s what those other black women were commenting on. Debbie Schlussel, you are among America’s most racist. Are you SERIOUS? Messy? Do you know anything about hard work? Do you know what it means to be an athlete? She wins a gold medal and you, and many other idiotic people on Twitter and this website, are focusing on her HAIR? You and people like you are the most petty, most brainless, most IGNORANT people to walk the face of the earth. 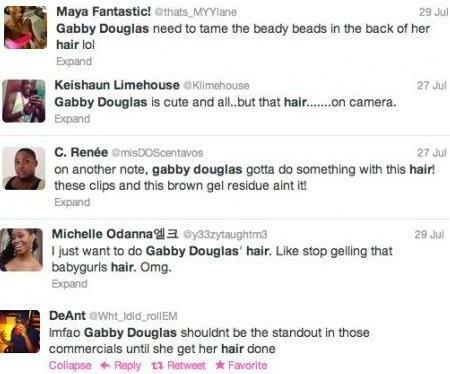 Debbie has every RIGHT to say what she said because it WAS the female black community who ‘hated on’ Gabby’s hair. What right does anyone have to critique her hair? It was tied back. Why the HELL would someone get their hair done when they’re GOING TO COMPETE? This is the 21st century. Females should NOT be expected to “dress up” all the goddamn time. If you disagree with that, you’ve internalized patriarchy to the WORST degree possible and I feel sorry for you. The fact of the matter is – any PERSON who commented on Gabby’s hair is nothing but a jealous and bitter fool. Why don’t you try doing something important with your life instead of wasting our -and someone as amazing as Gabby’s-time commenting on her hair. She’s accomplished far more in her SIXTEEN YEARS than you will EVER accomplish in your LIFE TIME. People like you don’t deserve the right to free speech. All you do is abuse it and disrespect intelligent and honest-working people. If you’re going to ATTEMPT to form an intelligent response, at least have the decency not to abuse the English language while you’re at it. An EXTREMELY disappointed human being. Same pitiful fools who (1) 96% vote for Democrats although Democrats were the party of slavery and the South until Lincoln and the newly formed Republican Party went to war for their sake; (2) never have said thank you to the more than 400,000 men and women killed fighting for an end to slavery; (3) never have been grateful to live in America instead of, say, North Korea. Awesome display of desiccated souls. A very nice thought, Jack, but Lincoln did not make war to end slavery. It became an afterthought. He went to war to prevent the Southern States from leaving the Union. The Emancipation Proclamation came later, and was a political move. It did nothing for the slaves in the North at that time. It addressed only those States that were in “rebellion” at the time. Also, “rebellion” is not the proper word since the Southern Confederacy was not trying to overthrow the U.S. Government, they were withdrawing from the U.S. to form their own nation. 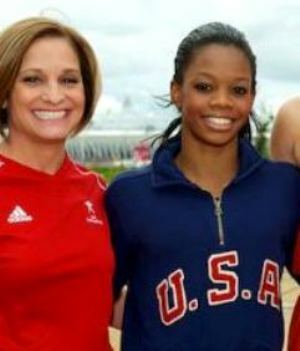 I wonder how many of the clueless boneheads that are making fun of Gabby’s hair can do what she did to win her gold medal? Instead of being a positive role for not just young black girls but young girls in general she is being made fun of and attacked by members of her own race. Growing up in West Virginia I saw how my sister and my cousins would do everything and anything to “fix” their hair to make it look white. Sadly this type of self loathing is going on today in the black community. Gabby is accomplished, well spoken, and polite. Some blacks think that all of those qualities mean that she is acting white or whatever. It is sad that they would rather focus on something trivial like her hair than the fact of what she did in the Olympics. Gaby hasd even said that she is puzzled by it all. Let me ask my fellow blacks another question. Who would you rather have as a hero for our community Gabby Douglas or Al Sharpton? Damn people, slow your roll! I think there were 10 tweets total complaining about Gabby’s hair. The vast majority of Black folks were so happy to see Gabby win that gold, as were most Americans. But a couple of Black-oriented media outlets created this controversy, and a whole lot of Black folks (including me) and many in conservative media took the bait. And as usual, it gives posters an opportunity to bash Black folks yet again with their unsolicted negative commentary, which Debbie seems to encourage…. Maybe her black crtics wnat her to be more nappy headed,beads and all like Serena the crip walk dancer, rather than with straight hair and a pony tail like Donna Reed. Wow, you found the Urban Dictionary. Those “tweets are both Petty, mean-spirited and very ignorant. The authors need to crawl back into their grubby hovels and stay there if that’s the best they can come up with for this young black lady who has excelled so brilliantly. She deserves all the accolades that are due her. Her detractors are merely demonstrating to the world just how low brow and classless they really are in spite of whatever accomplishments they might have achieved. I honestly wish that people (who should know better considering that they call themselves journalists) would learn the meaning of the word racist. While are those comments can be considered mean, jealousy fueled, or petty, they are not in and of themselves racist. You really don’t have a clue how ignorant you make yourself appear writing such asinine drivel. You do realize that saying someone is saying something out of racism, and then saying that they are saying it out of jealousy is completely contradictory, don’t you? So a handfull of immature black women bagged on Gabbys hair, and you write this whole article bashing the black race as a whole…. You are pathetic. Story of my life Debbie. I never paid racist blacks anymind, heck, some of them that called me a white boy in school are doing time in prison. It ticks off some of my black friends when I say this but, black people really are their own worst enemies. In my opinion Gabriel was the sweetheart of the olympics. And she earned two Gold Medals. That alone should stop all the foolish clamoring about her hair. For a 16 year old she has class, poise, confidence and what it takes to be a success. The one’s who were griping probably have little or nothing. Youre so cool! I dont suppose Ive read something like this before. So nice to find anyone with some authentic ideas on this subject. realy thank you for starting this up. this website is one thing that’s wanted on the web, somebody with a little bit originality. helpful job for bringing something new to the internet! Just want to say your article is as amazing. The clarity in your post is just excellent and i could assume you are an expert on this subject. Fine with your permission let me to grab your RSS feed to keep up to date with forthcoming post. Thanks a million and please keep up the enjoyable work.